ProSource® of Salt Lake has a broad selection of bathroom remodel products, because our team knows that with the right brands and design style, you can transform your client’s average bathroom into one they’ve always dreamed of! 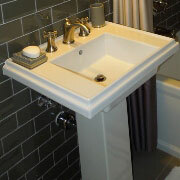 The bathroom sink can be as simple or stylish as your client wants, but its functionality should always be top-notch. We offer pedestal, vessel, shroud and standard sink styles at ProSource from our trusted manufacturers, and your client can get more customized by choosing their ideal shape, material and color. Selecting a stylish bathroom faucet is the perfect way for your client to add a subtle flair to the normally ordinary room. 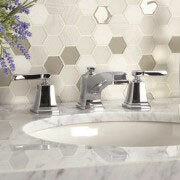 Our bathroom faucet collection showcases a variety of handle and material types, all of which are available in different color finishes and prices. A shower remodel is a common home project, mostly because the shower is a bathroom item that is used almost daily. Finding the perfect shower door and base is as important as finding the perfect shower detail accessories, such as the shower head, handles and faucets. 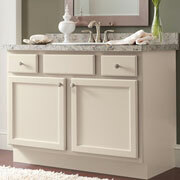 A bathroom vanity is a great way to add storage to a bathroom, creating more counter space for your client’s bathroom. Your client can also add mirrors, lights and more to get their bathroom vanity as customized and unique as possible! A bathtub remodel means finding a tub that looks great while also remaining functional. 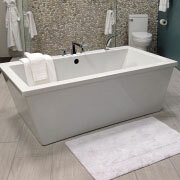 Our tubs come in fiberglass, marble and porcelain materials, and our team can also assist in finding your client a fashionable tub faucet and tub hardware, too! The toilet is likely the most used item in your client’s bathroom, which means you shouldn’t squander your client’s toilet decision. 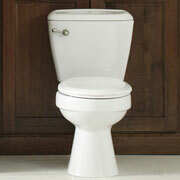 Our team can help you find your client the toilet that best suits their personal design and functionality preference.